WOOOHOO the week is half over , today I have an epic fantasy book for you actually it is book three in the Heirs of Destiny series . STORM OF CHAOS by Andy Peloquin. Against a rising tide of violence, heroes must risk everything for justice and peace. Kodyn hunts the assassin that thwarted his efforts to bring down the most corrupt and powerful politicians in the city. Elite warrior-in-training Issa is thrust into a desperate battle to quell spreading riots. Cunning street thief Evren plots to eradicate the ruthless crime syndicate profiting from the violence. Aisha finds herself drawn deeper into the world of the spirits. Her growing powers could lead to madness—or the salvation of everyone in Shalandra. 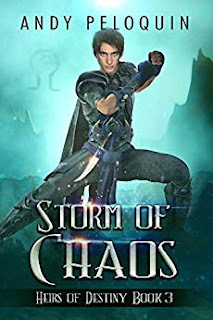 Together, the four young heroes and their allies must fight to bring peace and justice before their enemies unleash a storm of chaos, bloodshed, and death. Welcome back to Shalandra , where the violence is getting worse and our band of heroes are plunged deeper into the chaos . Koydn must find the assassin that stopped him from bringing down a corrupt politician . Issa is desperately fighting to stop the spreading riots that are going on between the classes . Aisha is heading deeper into the world of the spirits of the wronged as her powers grow she may have the power to help stop the riots . Evren well Evren is plotting to stop the criminal syndicate that is behind the riots . This is book three in the series and I will say the characters keep growing and becoming more and more complex . You see a massive growth with the characters. Evren really becomes a leading character and he is really becoming a hero . He is taking on a role of protector and really wants to get to the people involved not only to save him but his little brother Hailen and Breanna . I truly love how the author is writing this character . Evren started off as a thief but has grown into so much more . He is a true hero in my opinion . Now Koydn well he really needs a slap upside the head in this book , he is taking too many risks by himself trying to prove to him and everyone that he can do it and get out under his mothers shadow. He is growing up more in this book but he is also so very bull headed . Now for my ladies in the book ps I love both of these characters . Issa is fighting and trying to keep the riots from happening . She is so strong but she finds out some things that might just take her sails right out of her. You will love how strong and brave she is but you can also see her as a person who is having trouble with the choices she has to make . Aisha well she is just awesome . She is so strong and so ready to embrace her powers . Still scared that something bad will happen but she is fierce but she also is human and wants to help her friends and keep the peace . These books just keep getting better and better . There are 4 points of view in the series but each pov takes us to the same conclusion . Each character plays an important role to play as they each figure out their part in stopping the riots and finding out who is behind it . The author takes us on a rollercoaster ride that will honestly have you on the edge of your seat for most of the book . There is so much going on this book there is a mystery , lots of drama and I will say a little bit of romance amongst the heroes . This is a book that you can sit down and start reading and not stop until you are done . I will say that you should read the books in order so you can understand more of what is happening . These are books that are great for teens and adults that love fantasy, heroes and a strong story lines these are the books for you , Check them out . You will not be disappointed .